Sorceresses aren't just born wicked. Something had to happen to drive them toward the darker side of magic. 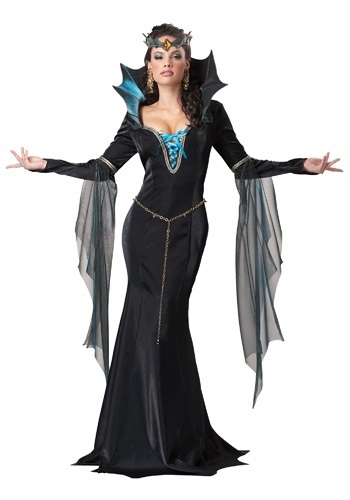 Embrace the darkness in this Evil Sorceress Costume, and cast some spells of your own. When a magician decides to start down the path to more sinister powers, they have an opportunity to pick what kind of look they want going forward. It's a pretty big decision, because it's going to determine what kind of magic they will cast, and it's hard to change it once that ancient, arcane energy starts flowing through them. They might choose to be an elegant but cold sorceress, who dazzles their victims with her beauty, or she might become an old crone, sacrificing her looks for even greater power. Whichever path she picks, she is going to be an amazing and terrible power to behold! If you picked the beautiful and dazzling path of darkness, you're in luck, because the wardrobe options are much more exciting! This costume is the perfect outfit for the budding dark enchantress who wants to charm her subjects, and have them do her bidding willingly rather than through trickery. The black velvet gown looks very mystical, and the mesh draping from the sleeves is mesmerizing. The stand-up collar and matching style headband give the costume a menacing aura, fitting of a true master of the dark arts. This outfit will make you the perfect villain of a fairy tale group costume, or the center of attention as you write your own wicked storybook! My daughter is fond of villainesses & she thought this costume was great! To start the dress had a small hole in the back and you could tell that it wasn't sewn together properly. It was noticeably too short and the sleeves weren't long enough. The model must have really short for it fit like that. The loops on the sides for the belt were very uneven, one was up really high and the other side was really low. I gave the dress two stars because the costume arrived ahead of schedule and I really liked the headpiece. The main thing in this costume is the Royal collar but in reality it is impossible to upward it and it's lying miserable and the costume just looks like casual and inexpensive dress.